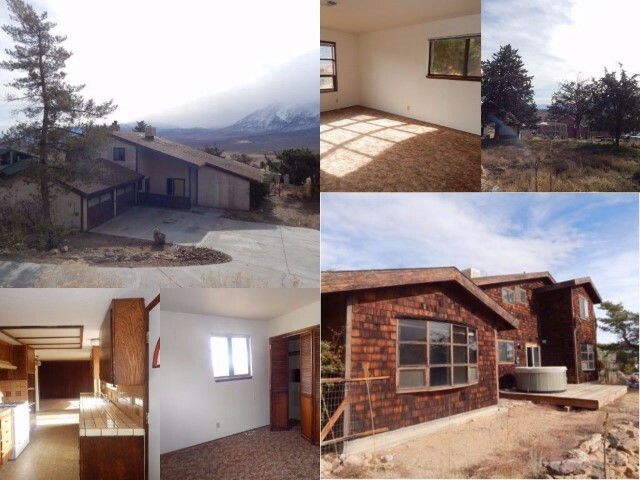 118 Scott Road is located in the Paradise Area, located outside of Bishop California. This friendly neighborhood is great for people who like open land and breathtaking views. This home has everything that you need to live in Paradise. The large open living room has plenty of views from the south facing picture windows. The home offers 3 bedrooms and 2.5 baths with tiled and carpet flooring throughout. A 2 car attached garage is conveniently located on the east side of the home. Entering from the garage is near the half bathroom and laundry area, if you come dirty from the trails. Homes in Paradise are known to have amazing views and this house is not an exception. Just walking out the back door, you get breathtaking views of the Sierra Nevada Mountain Range, and Valley from the deck. This home has low maintenance and drought friendly yards in the front and back. When we say its out in paradise we truly do mean it. This property is located about 15 miles North of Bishop in an area called Paradise. The neighborhood has dreamy views of Mt. Tom. This happens to be a larger community that has wide open space for all kinds of outdoor activities. It is on the outer skirts of Bishop, so you have a short commute to the local grocery store, recreational shopping, and restaurants. Round Valley School offers schooling up to the 8th grade as well as great schools in the Bishop area for the children. So if you are looking for a place you can call paradise, this would be the one!